This entry was posted in Wine Bottle Stoppers and tagged aritsian wood handcrafts, beautiful wine bottle stoppers, bottle stopper, Cutting boards, Greenville SC, handcrafted wine bottle stopper, loacal woodcraft artisan, uinque wood handcrafts, unique wine bottle stoppers, wine bottle stopper, wine stopper, wood lathe turned bottle stoppers. Bookmark the permalink. Hi Cathy! thank you so much, Happy Valentines! Oh what a unique idea, Michael! That’s exactly why winestoppers are such a pain, but you’ve solved the problem. They are all gorgeous! I hope you’ve patented this. They’re functional and beautiful, a perfect combination. Hi Suzanne!! Thank you so much! So glad you’ve now got Percy!! 🙂 Happy Valentines! These are beautiful!! I’m going to order one soon. I think this is a great idea with the height issue. Hi Maureen! Thank you so much! Michael your work is just spectacular! These are so unique! Welcome back! I have missed your posts and hope to see some spring photos soon. 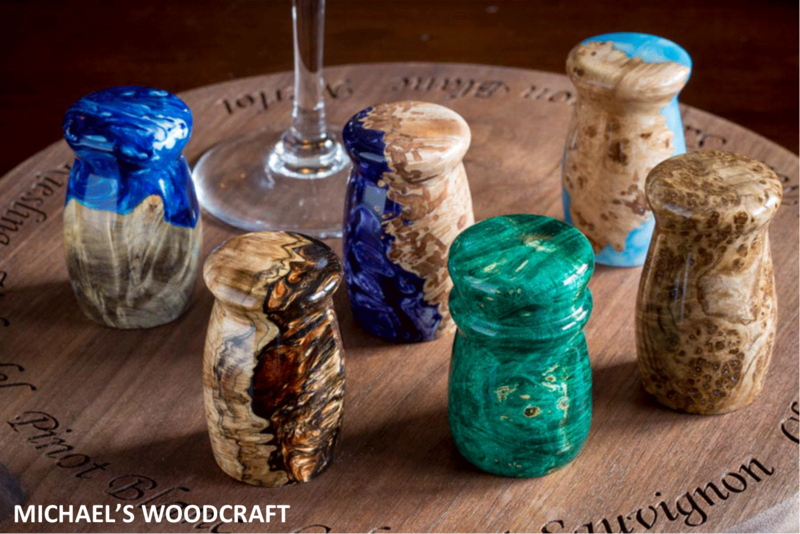 Love these wine stoppers – very pretty. Hi Tricia, I hope to be back more often, taking care of parents is not easy work! thank you so much! 🙂 I hope you had a wonderful Valentine’s Day! Really beautiful, I love the amazing craftsmanship that goes into all that you produce. Hi Charles, thank you very much! Michael! These are really, really lovely — and useful too. Hope your Valentine’s was great. Thanks, Michael. Like so many of your creations, these are works of art. Well done. I sent the link to a friend. I didn’t see the price of the wine stoppers. How much are they? I’ll def Italy have to stock up on a few for gifts! These are just a work of art as all of your work!